Classic Australian trade mark on this crown seal. 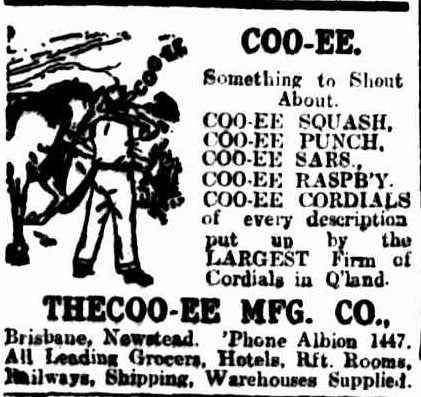 The Coo-ee Manufacturing Company began around August 1919 (the display advertisement below is from the Brisbane Courier, 6th August 1919). They seem to have just focussed on large bottles of cordial in the early days going by their advertising. The Coo-ee name features in some late 1920s advertisements for Orange drink that would have likely been sold in bottles like these. In 1932 the company was put up for tender (advertisement below: Brisbane Courier, 25th August 1932) and this seems to end the first phase of this business which is the period these crown seal bottles date from. The Coo-ee brand name itself was continued under a new business through until the 1950s at least again concentrating on Cordials to be mixed at home.